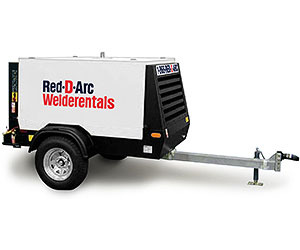 Red-D-Arc offers a comprehensive line of Hypertherm plasma cutters for rent. Request a quote online or call 1-866-733-3272. Cutting Range: 5/16" - 3/8"
Cutting Range: 3/8" - 1/2"
Cutting Range: 1/2" - 3/4"
Cutting Range: 3/4" - 1"
Cutting Range: 1" – 1 1/4"
Cutting Range: 1 1/4" - 1 1/2"
Cutting Range: 1 1/2" – 1 3/4"
Cutting Range: 1 1/4" – 1 1/2"
Virtually dross-free cutting capacity - mild steel 3/4"
Production pierce capacity - mild steel 1 1/4"
Severance - mild steel 3"
Maximum Mechanized Production Capacity 1"
Plasma cutters are useful cutting metals with a straight edge or cutting a bevel, gouging into material, cutting holes, cutting fine features or marking metal work pieces. It is used in any field where these types of processes are needed including manufacturing, steel fabrication, shipbuilding, pipeline construction and automotive restoration.